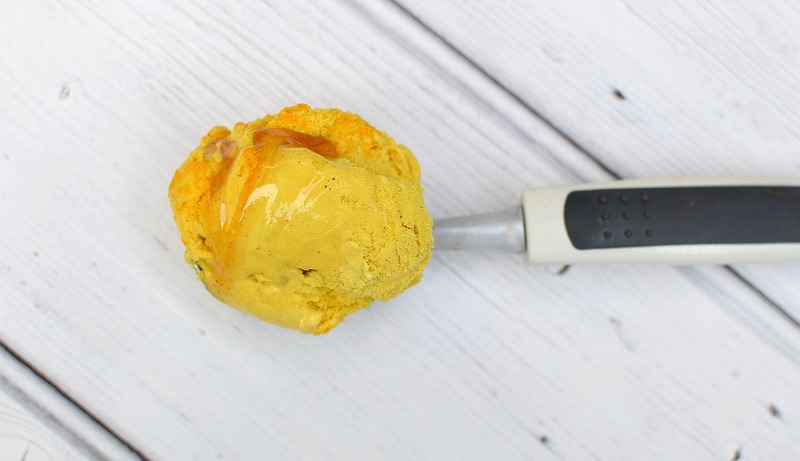 Turmeric Ice cream is another one of those ice cream flavours that sounds a little crazy at first. I’d heard that it not only tastes good, but also has some nutritional benefits thanks to the active ingredient, curcumin. Some of the benefits could include having anti-inflammatory properties, improved brain function, depression fighting properties and lots more. This ice cream was made with the Cuisinart ICE-30. The egg yolks in this recipe act as a stabiliser and it results in a creamy consistency that keeps you coming back for more. When you make ice cream with eggs, don’t let the milk boil as it can cook the yolks. I’ve done this a few times and trust me, it doesn’t end well. I added cinnamon and star anise to the custard base to add some extra flavour depth. It worked well but you could easily make this recipe without the added spices. Adding honey to the final product results in a fantastic dessert that even the sceptics will love. Add yolks and sugar to a medium bowl and whisk until well combined and pale in colour (set aside). Add milk, cream, tumeric, honey and star anise to a medium saucepan and stir on a med-high heat. Once simmering, remove from heat. Scoop out about 1 cup of the milk and slowly pour into the yolks, all the while whisking as fast as possible. Once combined, pour back into the milk while stirring constantly. Add milk mixture back to a medium heat and continue heating until it thickens and coats the back of a spoon. Don't allow to boil. Place in fridge for at least 3 hours, preferably overnight to enhance the flavour of the spices. Once cooled, pour milk through a fine strainer into your ice cream machine. Churn as per manufacturers instructions then add back to freezer for another 2 hours or until hardened. No Replies to "Turmeric Ice Cream Recipe"